April 27, 2015 By This post may contain affiliate links. Celebrate the beauty that is your mom this Mother’s Day by creating these colorful cupcakes in her honor. 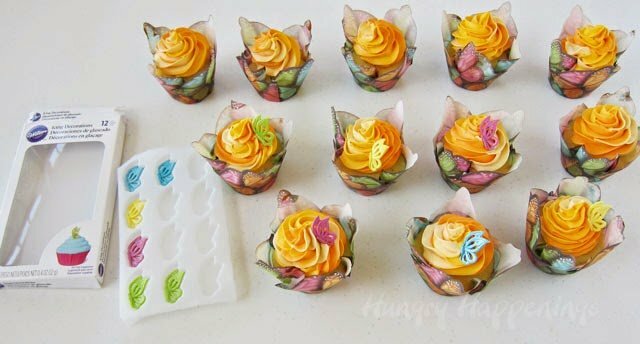 These cheerful Peach Cobbler Butterfly Cupcakes made using brand new Wilton products will surely make her heart soar. This post is brought to you by Wilton. Everything about these cupcakes makes me think of my mom, the artist, the dreamer, the romantic. She is just as colorful as these cupcakes and equally as sweet. She has always found a way to fly through life, flitting from one creative endeavor to the next. As a child, she encouraged my creativity and introduced me to Wilton’s cake and candy decorating supplies. Although her artistic medium of choice was paint, she understood my desire to create art out of food and helped me to find the tools I needed to succeed. When she brought me to the local cake decorating store to buy my first set of Wilton supplies, I was just a young girl full of enthusiasm but no skill, so she signed me up to take cake and candy decorating classes. Little did I know back then that Wilton products would become such an integral part of my life and that one day I’d become a brand ambassador for their company. I do suppose that my mom, who has been a brand ambassador for several art supply companies herself, might have envisioned this for me. She certainly didn’t think it was outside the realm of possibility. Last week I traveled to Chicago for Wilton’s Sweet Up Event where they unveiled their new product line. During the two day event we got hands on experience with some of the new decorating tools. 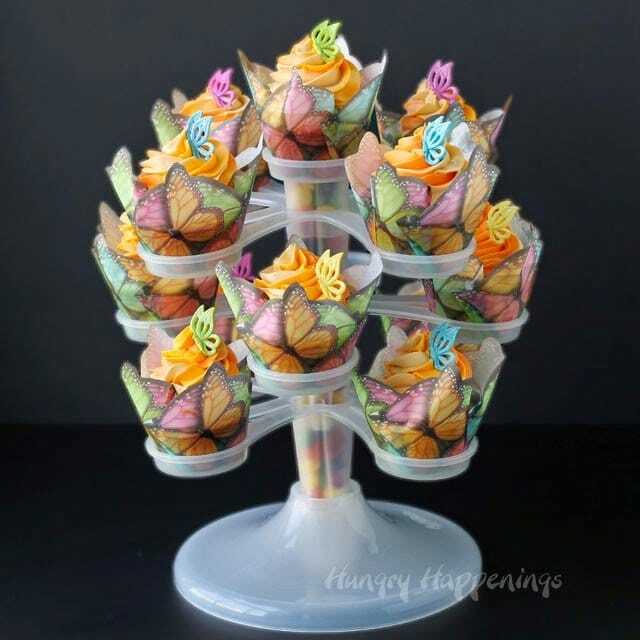 Today I’m going to share with you how I used several of them to make, decorate and display these butterfly cupcakes. The new Treatology Flavor System contains bottles of super concentrated flavorings including Juicy Peach, Toasted Coconut, Meyer Lemon, Creamy Vanilla Custard, Warm Cinnamon Graham, Fresh Basil and Crisp Champagne. 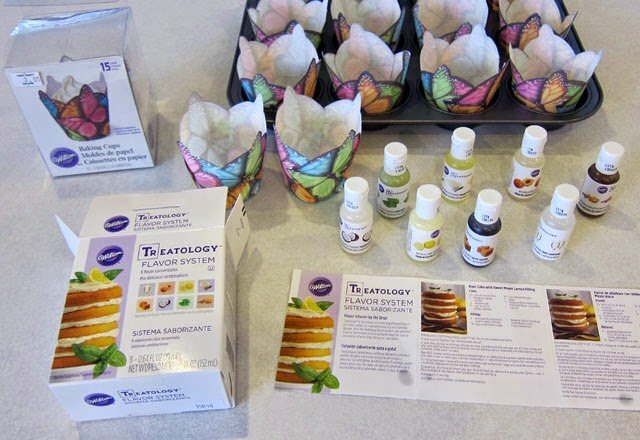 You can use the flavorings to enhance frosting, cakes, cookies, drinks and more. The flavors can be used on their own or combined in wonderfully creative combinations like peach cobbler. Wilton takes the guesswork out of it for you by providing you a booklet with flavor combinations. You can see the combinations at the Wilton.com/Treatology site, as well as lots of new and exciting recipes. To make a peach flavored cake, mix your cake mix according to the package instructions and stir in the Juicy Peach Flavoring. Then spoon the batter into your cupcake liners. If using the Butterfly cups, you’ll only get 15 cupcakes because they are quite large. They’ll take a few extra minutes to bake because of their size. To make the peach cobbler frosting, you’ll want to mix the drops of juicy peach, warm cinnamon graham, and vanilla custard flavors into your frosting. Then divide the frosting into three equal parts and color them. Using Wilton’s new Color Right System you can choose how to color your frosting. 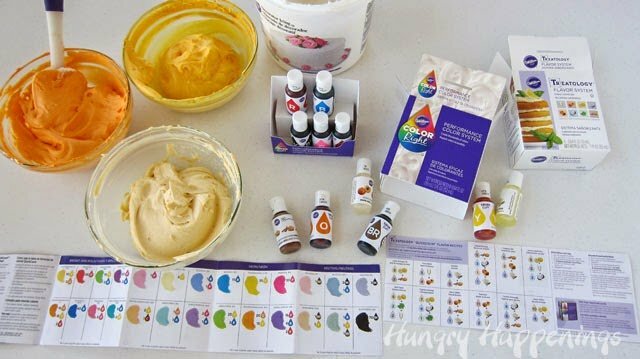 The box of super concentrated food colors contains 8 squeeze bottles of Yellow, Orange, Red, Pink, Blue, Crimson, Brown and Black. The enclosed booklet shows you exactly how many drops of each color to use to turn frosting or fondant into just the right custom color. They also have a buttercream, royal icing, and fondant color mixing chart, online. In keeping with the peach cobbler theme, I chose a peach, yellow orange, and cream combo. To get the beautiful multicolored swirl on top of each cupcake, I used the new ColorSwirl 3-Color Coupler. It’s such a cool tool. To use it, you fit pastry bags with the couplers then fill the bags with the different frosting colors. The couplers lock together to form one large coupler. Then you add the pastry tip and outer ring to hold it all together. You can leave your three bags separate, but I chose to put them down into a fourth bag. I found it easier to handle, that way. Pipe large frosting swirls on top of your cupcakes. To dress up the cupcakes, you can add a Butterfly Silhouette Icing Decoration on the frosting swirl. Once the cupcakes are all pretty, you’ll want to display them on something to really show them off. Wilton’s new Display Your Way adjustable tower is amazing. You can display 5, 9, 13, 17, or 25 cupcakes on the stand, based on how you assemble it. 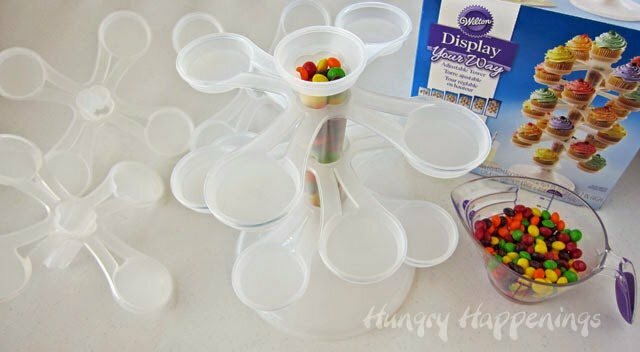 You can even fill the center with candy, nuts, beads, or ribbon. The stand is sturdy and clear, so it really shows off the cupcakes. I filled mine with candy and built it to hold 13 cupcakes. While we were at Wilton we got to sample some of their new recipes using the Treatology system. My favorite was their Toasted Coconut Cookies. I am definitely going to make those as soon as I have a chance. I am so excited to use all my new toys again to make some more treats. As a member of the Wilton Sweet Treat Team, I was compensated, given free products, and treated to all expense paid trip to the Sweet Up Event. All opinions expressed here are my own. What a sweet tribute to your Mom! Wilton is lucky to have you as their ambassador as you have created some really amazing treats using their products. These beautifully displayed cupcakes are no exception..and with me being being a southern girl, we love our peach cobbler! Thanks, Karen. My mom is very special to me and I enjoyed writing about her. I love working with Wilton and feel blessed to be a brand ambassador for them. These are beautiful! You have shown your mother's beautiful, sensitive art work before and I agree that these represent her femininity well! 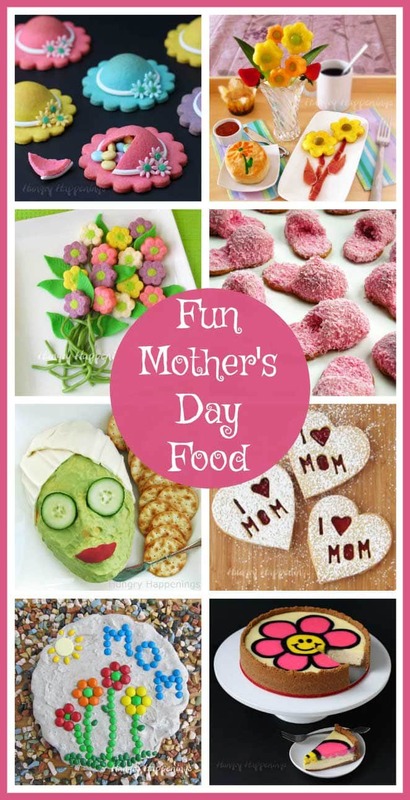 Once again, here's an idea that any ordinary person can turn into extra-ordinary with a few inexpensive purchases and an hour or two of fun time in the kitchen! Thanks, J. I tried to keep these treat simple but think they do have big WOW factor. My mom loved them. I am so excited to try all the new Wilton products. 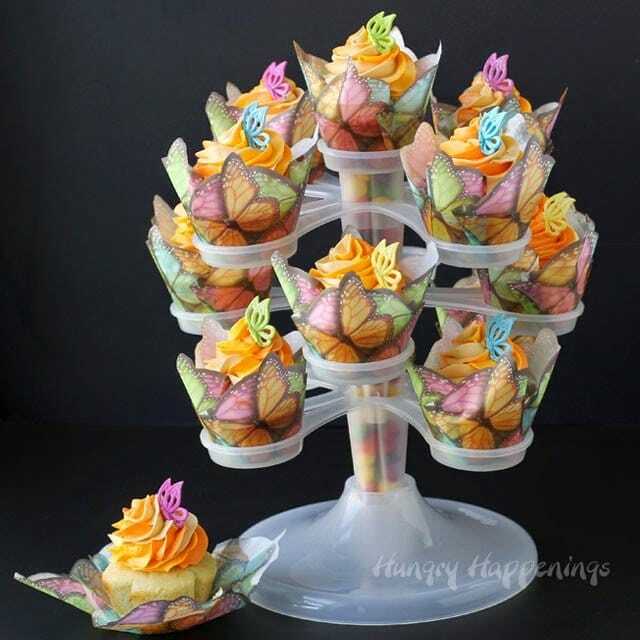 I love the butterfly cupcake papers and those tiny butterflies are darling! 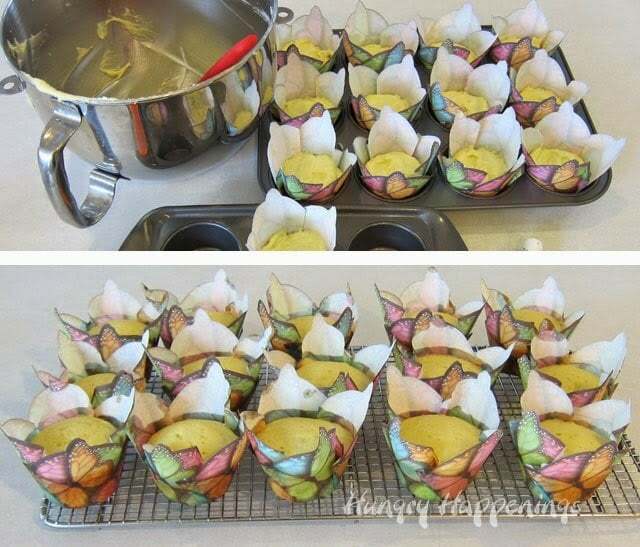 I love the butterfly cupcake liners. They were actually the inspiration for these cupcakes. They look even prettier in person. Oh, that is so sweet of you to say. I'm so happy you like them. Thanks, Cristina.